Total Books Read in Five Years: 142. This averages out to about one book every two weeks. 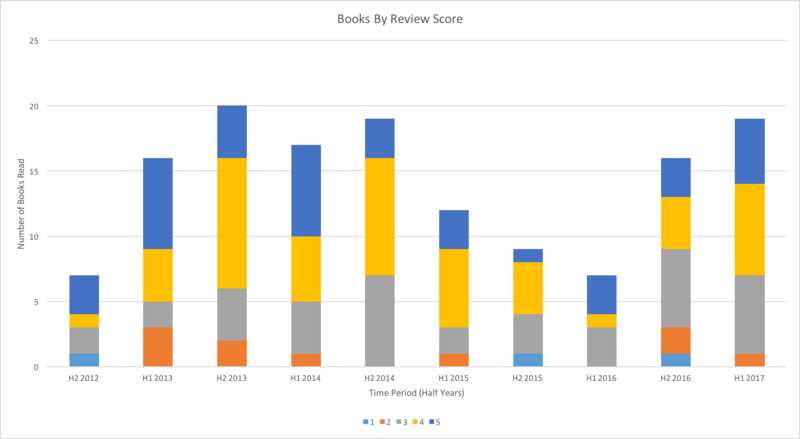 Average review score makes sense when I reflect upon the two major influencing factors: The sample of books I’ve read (and how that’s selected), and how I grade. I typically read books that I already know I will like or have come recommended, which will naturally bias the set. The exceptions are the impromptu airport or used bookstore buys, or books that are well-known that I’ll read for the sake of having said I’ve read it (like Atlas Shrugged and Isaac Asimov’s Foundation). Then, I try to grade using a normal distribution (where a 3/3 is “average but recommendable”) as opposed to the “letter grade” scale (where anything less than 75% is bad). These two factors show up in the average. I’m naturally inclined to read things I already know I’ll like (which would push the average score up), but then try to consciously grade on a somewhat normal distribution (which would anchor the average around three out of five). 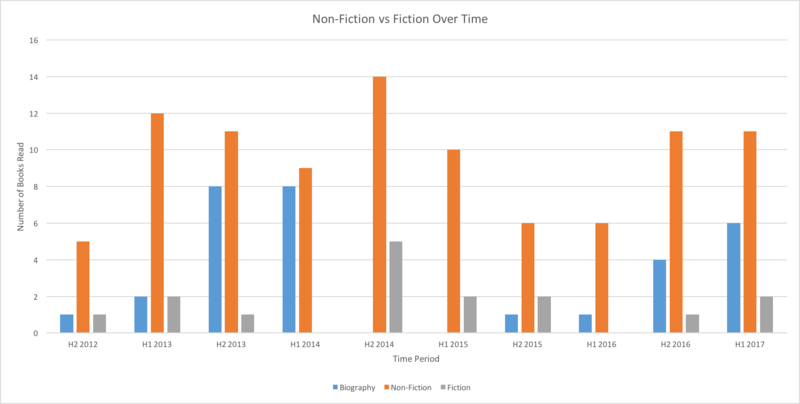 Following the overall quantity numbers, the next question to come to mind was whether the lengths of the books affected the quantity read in a given time period. Since books vary by length (mostly measured by number of words), it’d really be more precise to track “words read per six months”. But since that’s not really practical, the combination of books by quantity and then estimated length per book are the next closest thing. 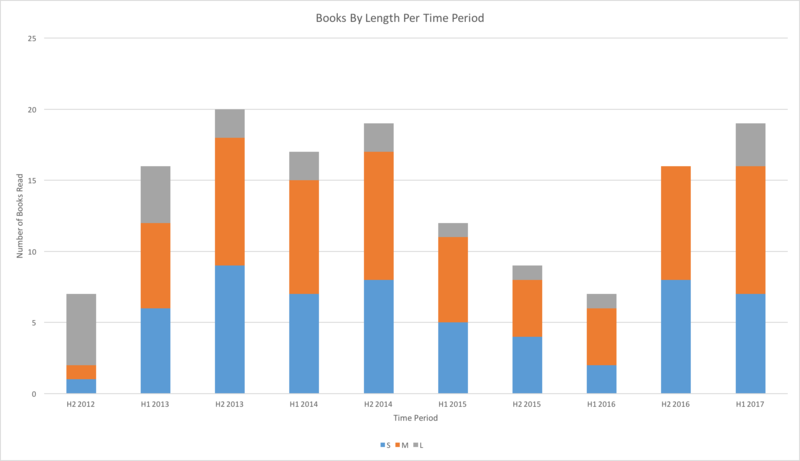 One could also suspect that, if I were reading at a consistent pace all five years, that periods with low book quantity would be balanced by the fact that the books read were longer/had more words. I have only categorized books into three sizes (short, medium, and long lengths), and it’s an imprecise categorization, but it does provide some insights. It’s clearly noticeable that in my first six months in Chicago reading longer books (Atlas Shrugged on the bus trip moving to Chicago) that took up most of that time. The periods with the highest total quantity read were packed with many shorter books. Next is a list of authors I wanted to highlight authors who I read before moving to Chicago who also had books read in these five years.